The finals of the LLWS are this weekend. The USA and International Championships are on Saturday. The finals are on Sunday. All via ABC. If you are just catching up, here are 7 things we’ve noticed after watching all 28 games leading up to this point. 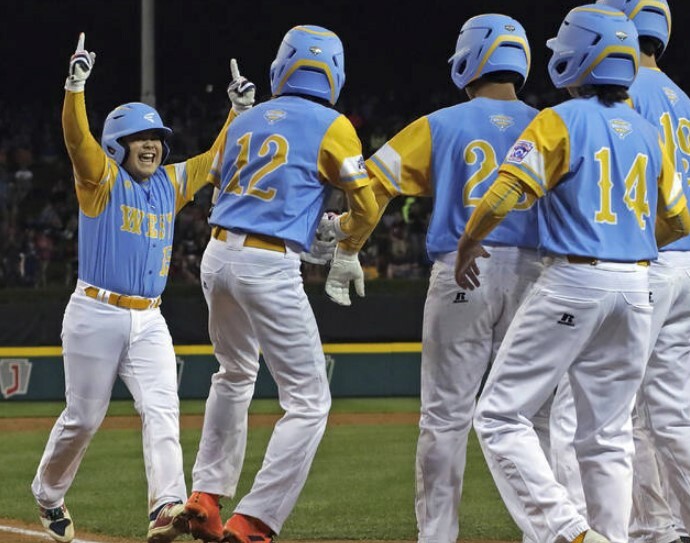 Consider this your primer on the 2018 Little League World Series Championship Sunday. Notice the 13 Year Olds? Not for Long. The first thing you’ll notice is the game type has changed. Home runs and extra base hits are way down. This is due to the bats. (No doubt, you’ll hear the announcers comment on this a number of times). “Is safety the reason for the change? Instead, they trusted the new bat standard ensured “the long-term integrity of the game.” No one ever quite clarified what “integrity” meant. You can see all our reviews for these bats in our USA Bat Review section. “Integrity,” as USA baseball used it in their answer, surely didn’t mean a game that looks more like the Pro or NCAA game. If it meant to then the standard missed the mark in remarkable fashion. The MLB and NCAA hit home runs at a 1.15 to 1.23 per game rate, respectively. After the championships this Sunday, the new bat standard produced 18 home tins on 31 games. That’s just shy of 0.6 per game. Extra base hits are also at an all time low and the LLWS has NEVER had this many extra inning games (because no one can score). You are welcome to like that sort of baseball game. Defense and small ball matters. It’s fun in its own way. Some games, like Hawaii’s 11 inning 2-0 win over Georgia, were epic. But, comparative, the games this year look more like a fastpitch game than a baseball game. Fun, no doubt. But, we see no correlation between engendering small ball among Little League, unlike any other baseball league you can see on TV, and the long term integrity of the game. Feels more like the exact opposite. One controversial idea is simple enough. Move the fences back to their original distance of 205 feet (down from 225). More than a few kids have destroyed the ball this year, with a swing and trajectory that deserve a home run, but still fall 10 or 15 feet short. Or, better yet, move the mound back 5 feet. If this is a 2/3 game then kids should not be throwing 80, more like 65. Notice how many of the players in the championship games are 13 years old? About half the kids in this tournament, and the majority of the very big ones, will not be here in 2019. The age change, announced several years ago, finally catches up to the 12 year old bracket. In some sense this will be good. 6 foot 2 man-childs throwing jet fuel from 46 feet is ridiculous. One kid from Panama was reaching 80mph on his fastball. It’s dangerous and still somehow comically huge–akin to hitting a 105mph fastball from a 9 foot Sasquatch in the MLB level. This isn’t a 2/3 game when pitchers are throwing 90% the speed of MLB guys. The age change will do this tournament well. So would moving the mound back 5 feet. You will also see a number of kids wearing a Jaw Guard (aka C Flap). In April we wrote an article and started a petition asking Little League to requireC-Flaps or Jaw Guards. By July, USA Today had picked up the story, asking similar questions. In the name of safety Little League was banning helmets that were improving their safety. It made (and still makes) no sense. Jaw Guards, previously ILLEGAL in Little League because they didn’t get a red tape certification to be used for safety, were pushed through for a few companies by the time the 2018 LLWS came around. And thank the heavens they were. By August the industry had C-Flaps for the LLWS and a number of kids started wearing them. Turns out, this Hawaii kid’s life was possibly saved by it. At a minimum his jaw and a couple teeth were. The biggest loser of the USA Bat change has been Easton. In previous years they absolutely dominated the Little League World Series with their Orange Mako and, before that, S1’s and XL1s. 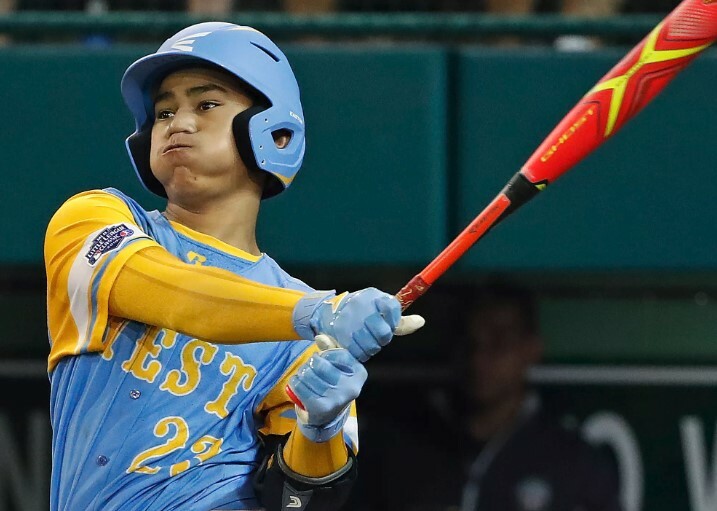 This year, with a reset of the standard, a few major companies stepped to the plate with offerings kids couldn’t put down—despite a load of free bats from Easton to start the tournament. Easton did put together an impressive 2019 line of USA Bats. But, without a doubt, they lost ground to others. Rawlings, previously a mere blip on the map in the Little League space, has benefited greatly. 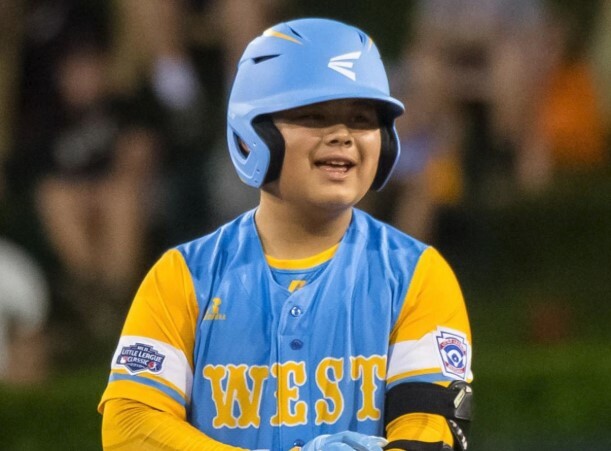 (At least in terms of eyeballs on their bats in the 2018 LLWS). Expect to see the Rawling’s Quatro and Quatro Pro several times this weekend. Behind that you’ll see a number of Demarini CF Zen’s and Louisville Slugger 718s & 618s. (We document 2019 USA Bats here). 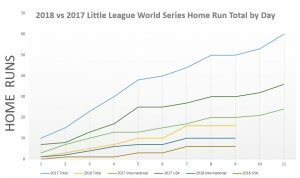 From a bat structural standpoint, we find the frequency of aluminum barrels in this year’s LLWS, instead of composite, remarkable. Before this year we rarely, if ever, saw an aluminum barrel at the plate. This year though, aluminum barrels split with composite barrels 50/50 at the plate. As a group that reviews bats obsessively, this is noteworthy. (See the differences between composite/aluminum/wood). Despite the new bats and orchestrated commercialization of a kid’s game, the LLWS is just a fantastic watch. After 30 games of kids battling it out with their friends against teams across the planet it’s hard not to love everything about it. The dizzying strike outs, the sometimes laughable officiating, the mom’s reaction in the stands, the personalities of kids, seeing some kid’s reaction to 70mph+ at 46 feet. And the celebrating. These make up just a snapshot of some of the best moments sports can offer–all wrapped up in a team or two you can root for—in an otherwise short game. Despite all the hoopla created online during the year, not a single wood bat was taken to the plate. As we’ve said all along, composite and aluminum bats are better than wood even if the “stand.... The best players and teams in the Little League space appeared to have figured that out too. Also based on the buzz online within some facebook groups, not a single Dirty South USA bat made it to the plate either. Even from the Georgia team who live in the area the Dirty South bats exist. Based on the online facebook groups we thought for sure we’d see a couple. *Since first publishing this article, We had a couple readers tell us that Little League has some barriers to entry beyond just USA bat approvals. Dirty South, unwilling to play the that game, didn’t play along and therefore wasnt allowed in the tournament. We are working on confirming this. 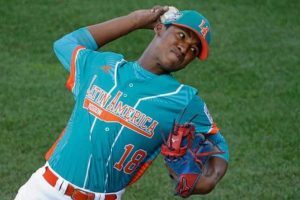 This kid from Panama throws 80mph+. From 46 feet that’s over 104mph. The international side of the bracket is just better than the USA Side. Granted, the International side is made up of the champions from each world wide division, while the USA Side is showing the tournament the International teams already won. Hawaii is a deserving winner on the USA side. They can clearly play with anyone. In a one game series, though, anything is possible. But, no doubt, the International side of the bracket has 5 teams (Panama, Mexico, Japan, South Korea, Puerto Rico) that might be better than any team on the US side note a 5 game series. There are a few remarkable players on the US side. We wish there were some sort of all tournament team players we could vote on. After watching every game on the US side, here would be our top 7 votes. Count this as the Bat Digest LLWS Valuable Player’s Award. Sean Yamaguchi, Hawai’i. Life of the team, fantastic hitter, most fun to watch. Aukai Kea. Hawai’i Man Child. Jet Fuel on the mound and plate. Jarren Purify. Michigan, Possibly the best overall player in the US side of tournament. Steven Martinez, New York, Best Looking Swing in the Tourney, Great Short Stop. Gregroy Bruno, New York, He has better mechanics than some MLB pitchers. Jansen Kenty, Georgia is nothing without this guy. Aside from Purify, possible best overall player in US LLWS. Tai Peete, Georgia’s 2nd best player, but may end up being its best in the long run. All the tools to play at the highest level of the sport. In the past, others on this site have called the USA bats a "cash grab" or a scam? Do you still feel this way? Reading this article, it seems like LL was trying to give Easton an advantage as the big sponsor of LL but other bat companies like Rawlings made a better product. My nephew is using a new Rawlings USA aluminum bat. He loves it and it seems better than the ones his teammates use from Easton. There is a distinct difference from his USSSA Rawlings bat though. The USSSA model has significantly more pop than the new USA bat. I still feel that if you're trying to make the bats like wood, just use wood. Also, stop buying a new bat every season.